Initially, these stickers were conceived to store the entire first wave in four storage boxes (two per faction). Further development of this range now requires two additional storage boxes in order to store it all neatly (one for the Orks and one for the Ultramarines). The extra storage space also allows for some reorganization of certain drawers, more specifically those with mixed color codes. Ork Command: This sticker replaces the ‘Goff Command & Customization’ sticker and lets you store all War Bosses (Goff, Bad Moon, … and others, if you like) and Command Options. Stompa: The Stompa from the Bad Moon Reinforcement Pack needs a new drawer to store its Recruitment Tile and its Options. Note that this is the only unit of the current HoBR pre-order in need of a new drawer. Obviously, the Stompa itself joins the other atypically sized counters (Gorkanaut, Land Raiders, …). Vehicle Gear: In the storage system these options were initially mixed together with Gear Options. The extra available space – when using three storage boxes – allows for a dedicated drawer for Vehicle Gear Options and simplifies the selection of these options during setup. 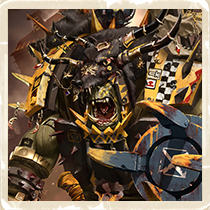 Ork Customization: This sticker also replaces the ‘Goff Command & Customization’ sticker and allows you to store all Customization Options without mixing them up with the War Bosses and their Command Options. Characters: Thanks to this sticker, you can now store your Ork characters separately. We made this sticker because some people in the community requested it. However, in our storage proposal it should be noted that all neutral characters are stored in the neutral drawer of its clan (with the checkerboard stripes). When you specifically dedicate a drawer to characters, you’ll lack one drawer, but you can always organise things different than our proposal. Gear: In the storage system these options were initially mixed together with Vehicle Gear Options. The extra available space – when using three storage boxes – allows for a dedicated drawer for Gear Options and simplifies the selection of these options during setup. 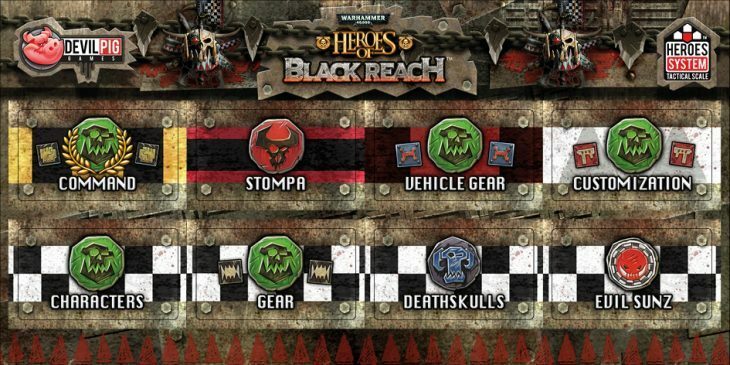 Deathskulls: In the storage system these options were initially mixed together with the neutral Evil Sunz Options. The extra available space – when using three storage boxes – allows for a dedicated drawer for Deathskull Options and simplifies the selection of these options during setup. Evil Sunz: In the storage system these options were initially mixed together with the neutral Deathskull Options. The extra available space – when using three storage boxes – allows for a dedicated drawer for Evil Sunz Options and simplifies the selection of these options during setup. When following these guidelines, you’ll now have two empty drawers… Rest assured, these are not redundant. I would like to remind you that storage boxes need to be ordered separately from the currently running pre-order campaign. ← HoBR – Pre-order open!!! I’m going to wait and see. I have a lot of space in the big box that I’m using for the large vehicles only at the moment. Thanks for the explanation of the storage drawers and what goes where. Will order one extra ork storage and one extra UM storage now. Cool, déjà c’était donc bien une bonne idée d’investir dans 3 boites. Fantastique, merci pour les explications!